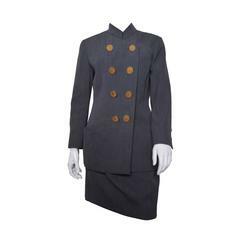 Chanel by Karl Lagerfeld brown wool tweed 3 piece skirt suit. Jacket with gold lion buttons, silk lining with interior gold chain hem. Matching below the knee skirt.